The popularity of bamboo in the United States has grown, thanks largely to the efforts of the American Bamboo Society, which actively promotes this beautiful and useful evergreen. According to the society there are 33 cold-hardy varieties of bamboo. This includes three species tolerant to temperatures as low as -20 degrees which would be suitable for the climate of northern Pennsylvania. These species are known as phyllostachys, pleioblastus and pseudosasa. These are all runner-type bamboos meaning they spread quickly by sending out underground rhizomes. Choose a sunny location with well drained soil for your bamboo. Although most varieties will tolerate partial shade, bamboo does best with full sunlight. Most of northern Pennsylvania is covered with sandy loam to silt loam soil as found in the Allegheny High Plateau and lower plateau to the east respectively. 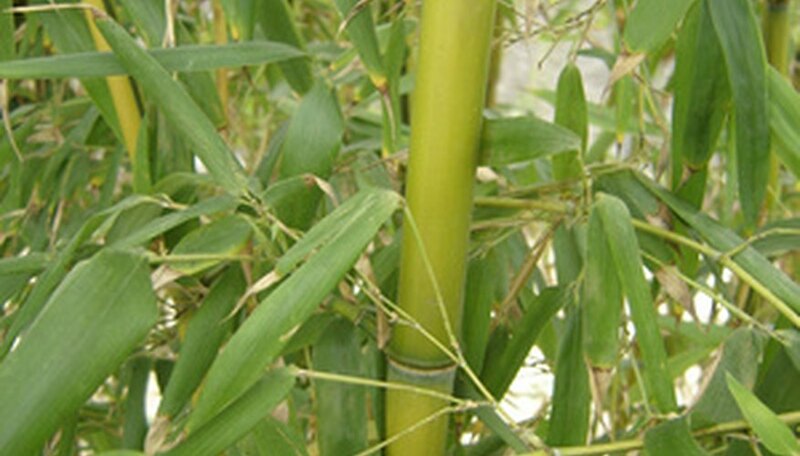 Both types of soil are generally very good for growing bamboo. If your soil is heavy or contains a lot of clay, amend it by covering it with 4 to 6 inches of mulch at least a month before planting. Dig planting holes twice as wide as the roots of the bamboo. The depth of the holes should match the height of the root so that the base of the stem is an inch above ground level after planting. Installing a root barrier around the bed or growing area will make it easier to control the spread of runner-type bamboos. Root barriers are flexible plastic panels that prevent rhizomes from spreading by forcing them to the surface for easy removal. Dig a trench 36 inches deep around the perimeter of the bed and place the panels so that they are angled slightly away from the plants. Backfill and ensure that at least 2 inches of the barrier is above ground level so that the rhizomes can’t grow over the top. Prune off the rhizomes as they come to the surface along the barrier. Give the bamboo an inch of water after backfilling the hole. Spread 2 to 4 inches of mulch over the planting area. This will give your bamboo plenty of organics and simulate the humus rich forest floor of its natural habitat. Water your bamboo frequently. Even though northern Pennsylvania averages 3 to 4 inches of rain per month through the growing season, giving your plants an additional inch of water per week will get them off to a good start through the first year. Once the bamboo is established, rainfall should be adequate but be sure to irrigate during dry spells. Fertilize with a high nitrogen organic lawn fertilizer after planting and every few months thereafter. Do not put fertilizer in the planting hole to avoid burning the roots. Prune your bamboo regularly to maintain it at the desired height. Use pruning shears when the shoots are young and a pruning saw once the stems become woody. Keep your pruning tools sharp and make clean, flat cuts across the stems. As a type of grass, bamboo will take any amount of pruning and just keep coming back. Based in Surrey, British Columbia, Stephen Oakley is a freelance writer focusing on environmental issues, travel and all things outdoors. His background includes many years spent working in the Canadian wilderness and traveling worldwide.